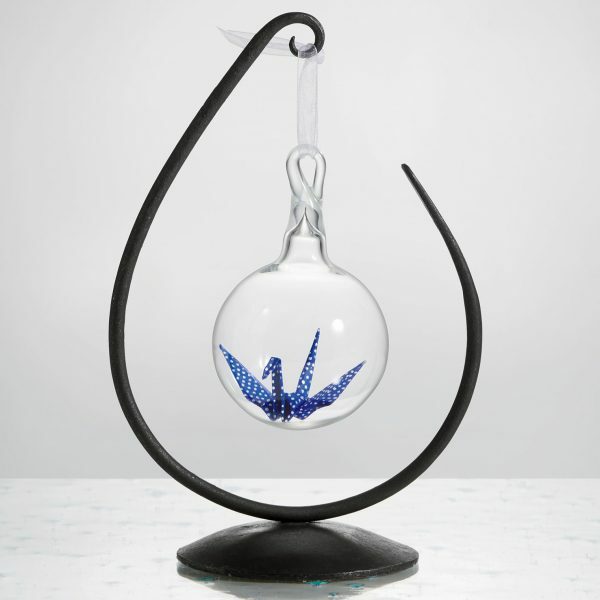 When we first saw “Starry Night” by Adam Parsley, we couldn’t help but ask, “how did he do that?” Like a ship in a bottle, this delicate paper crane inside of a blown glass sphere seems impossible—we are awestruck as we try to imagine how it is created. It was because of this wondrous, enigmatic quality that we chose it for our 2018 Ornament of the Year. Starry Night looks simply beautiful displayed in the Teardrop Ornament Stand by Steven Bronstein. This enchanting ornament came to life thanks to the great imagination and technical skill of glass artist Adam Parsley. He has developed a meticulous process to enclose each origami paper crane in molten glass without burning it. We wanted to find out more about the artist’s inspiration for this stunning piece, and though he wouldn’t reveal his secrets, he did tell us more about his work and his journey as an artist. Glass artist Adam Parsley holds one of his “Starry Night” ornaments. Adam first became interested in glass at the age of fifteen when he discovered the National Bottle Museum, a non-profit museum and studio in upstate New York. He was excited to find that the museum hosted glass classes for kids. His dad, always supportive of his passions, drove him there twice a week for lessons. 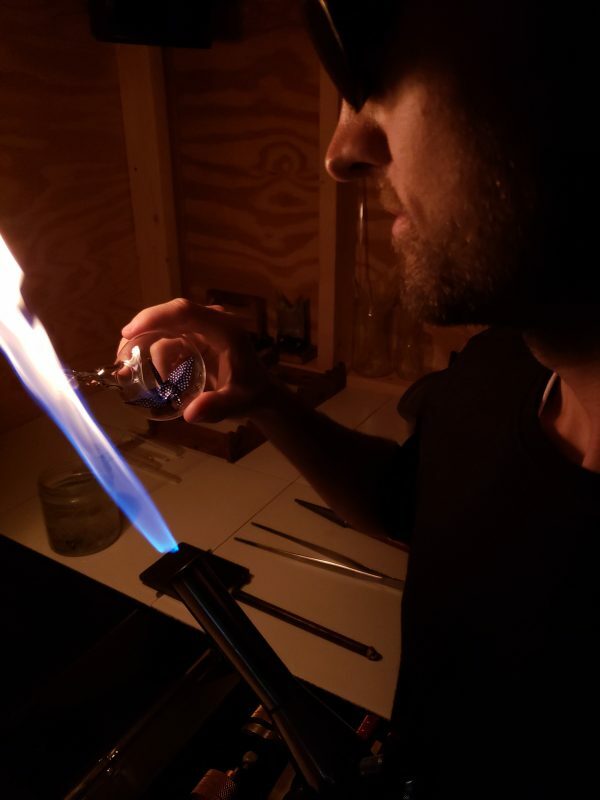 Under the tutelage of owners Jan and Larry Rutland, Adam got his first taste of the thrill of shaping glass with flame, first making soda-lime beads and then borosilicate pendants. 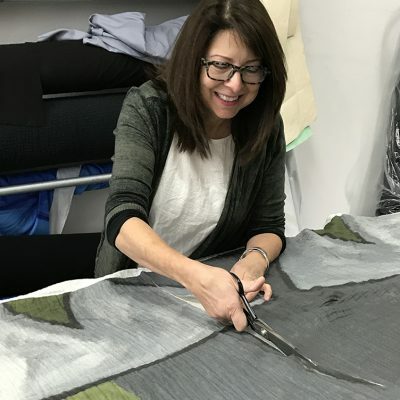 He later studied with master glass artists Sally Prasch, Mike Plane, Christopher Rice, and Suellen Fowler, experiences that helped him develop and refine his techniques. 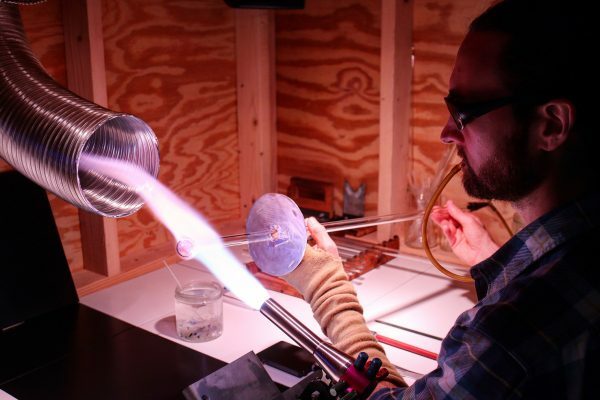 Adam Parsley melts and shapes glass using a torch. In his work, Parsley is interested in “anything that grabs me and sparks my passion enough to dive into the rabbit hole of excitement and design.” He loves to explore the beauty of simple forms and discover the complexities beneath their surfaces. His “Starry Night” ornament evolved from one of his personal projects. 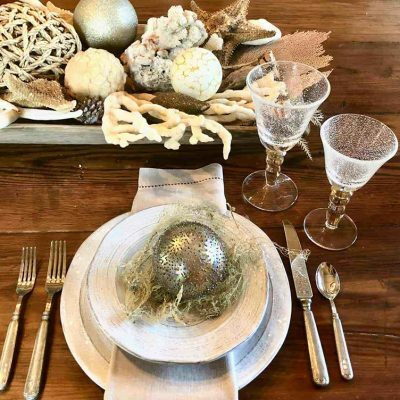 Every year, Adam makes all the presents he gives to his family for the holidays, and each year, he aims to outdo what he did the year before. 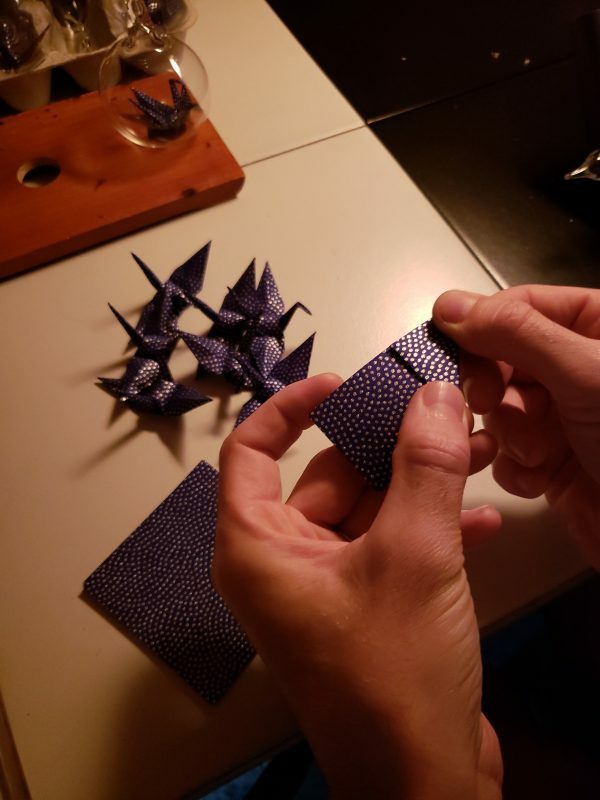 Adam Parsley folds each origami crane by hand. Of course, the year after that was an even greater challenge. How could he possibly top the paper cranes? 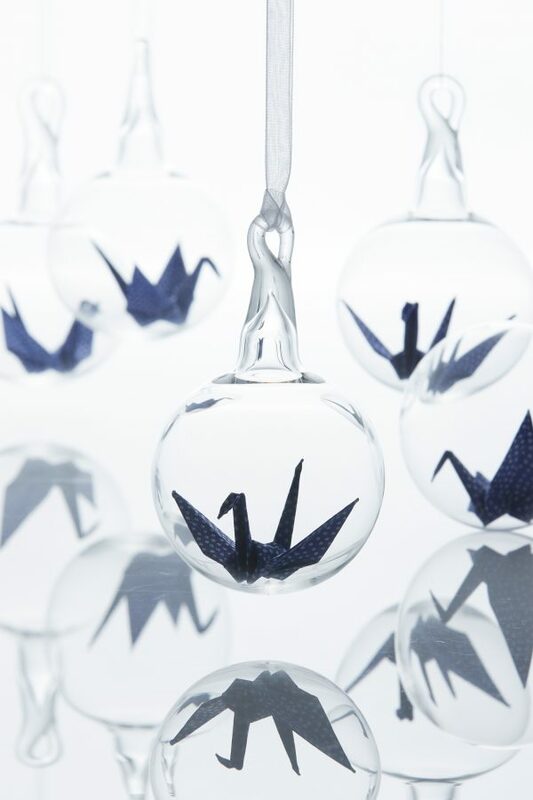 And then an idea came to him: paper cranes in glass. 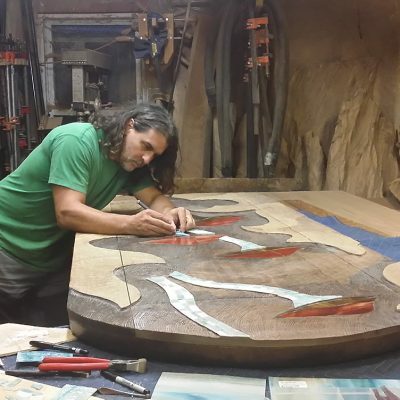 Adam Parsley puts the finishing touches on one of his “Starry Night” ornaments. 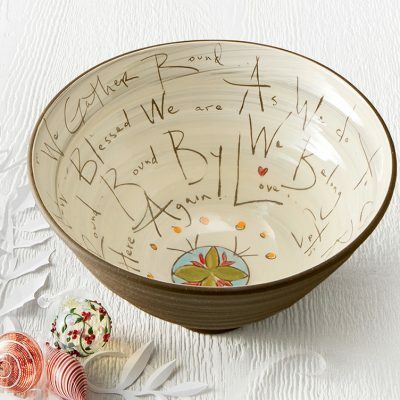 With such a response, he realized that these ornaments might have a broader audience than just his family. He spent the next few years honing his process and refining the form until he was finally satisfied. The result is the remarkable “Starry Night” ornament available today—one we are honored to call our 2018 Ornament of the Year. We are thrilled to have the opportunity to work with Adam Parsley and offer his stunning work as part of this year’s ornament collection!